“Americans love their pets. And they love their devices. Pet tech products satisfy both affections by creating a closer bond between pet and owner, and by using technology to make pet care easier,” says David Sprinkle, research director for Packaged Facts. Whether you want new ways to monitor, entertain, or feed your pet, there’s a growing array of smart devices that offer creative, technology-driven solutions to help keep pets happy and healthy, even when you are away from home. Here’s a look at five key pet technology trends for 2019, based on research from Packaged Facts. 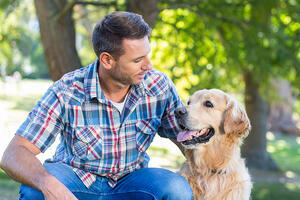 Want to know how your dog is doing, or track its activity levels when you’re gone? Devices like FitBark can give you a window into your dog’s daily habits. These monitors clip onto a dog’s collar and automatically log its distance traveled, sleep, and calories burned through a smartphone app. They also allow you to share information with your veterinarian. If you’ve ever had a racoon or neighborhood cat wander into your house through the dog door, now there’s a new way to prevent unwanted intruders. The Microchip Pet Door from SurePetcare allows pet owners to control the pet door remotely with the use of a smartphone. The pet door will only open when it reads your pet’s microchip or RFID tag. You can also receive notifications when your pet leaves or enters the house and choose to keep your pet indoors at certain times of day. Soothing your anxious dog — even when you’re away — may have gotten easier with the help of technology. ZenCrate by Plug and Play Robotics is designed to relieve your dog’s stress with motion-sensor-activated fans and a calming playlist that turns on when your pet goes inside the crate. Or if improving your pet’s overall health is your main concern, another option is a Smart Pet Bed by Petrics, which includes climate control and a built-in scale. The system is connected to an activity tracker and health & nutrition app and can be connected to Google’s Alexa. Technology can also help keep your pet entertained when they are home alone. CleverPet Hub is a smart pet toy with a treat-dispensing game for dogs and cats. The toy’s touchpads light up and make noise in different sequences, and the pet must tap the correct touchpad to get a treat. The software can adjust the difficulty level with longer patterns as an agility and memory puzzle to keep pets busy. Another innovative pet toy is the Pebby Smart Ball, a smartphone-controlled ball that uses Wi-Fi, Bluetooth, and a built-in camera to allow you to maneuver it remotely. You can also select an auto-play feature to keep your pet entertained when you’re busy. New smart feeders can allow you to feed your pet from anywhere using your smartphone. You can schedule feedings or feed your pet on demand. One example is the ProBowl by Obe, which has a smart base that connects to your phone via an app. The app records the amount of food and water your pet consumes and alerts you to unusual changes. You can also sync the app with Amazon to reorder food automatically with home delivery. While the popularity of specific smart pet products will vary, innovative pet products have become a big business — one that is expected to expand in the coming year with new innovations across a range of categories. Staying connected with your pet will be easier than ever. For more information on the latest pet product trends, read Durable Dog and Cat Petcare Products, 2nd Edition by Packaged Facts, a leading market research firm known for its expertise on the pet industry. This report focuses on product innovation and consumer preferences and covers everything from toys, collars, and leashes to pet beds, carriers, and fashion accessories. Download a sample of the report to get more information.